Report: Liberian Charity Worker Raped Girls He Was Supposed To Help : Goats and Soda A report from ProPublica and Time Magazine documents rapes committed by an employee of More Than Me, a charity that had raised $8 million and earned praise for its work. We interview the co-author. 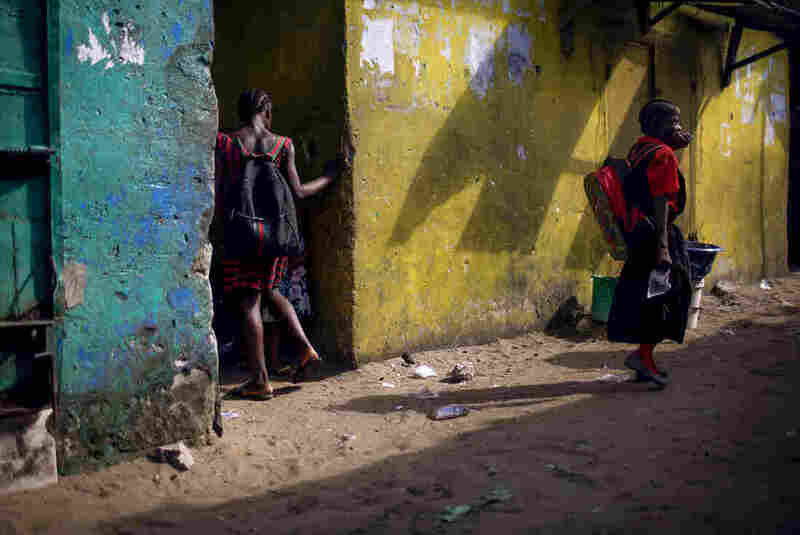 A girl wearing the More Than Me uniform walks into an alley in the West Point neighborhood of Monrovia, Liberia. This week, ProPublica and Time Magazine released a report on More Than Me, a charity founded by American Katie Meyler to provide an education to Liberian girls and protect them from sexual exploitation. In 2012 the charity won the $1 million American Giving Award, sponsored by JPMorgan Chase. In 2013, MTM started its own school. Over the years, it raised some $8 million, with a nearly $600,000 contribution from the U.S. government. The press praised the group, particularly as the Ebola outbreak unfolded in 2014. NPR highlighted the charity's work in a post here. But according to the report, Macintosh Johnson, a Liberian identified as a "co-founder" of MTM, raped a number of girls from the academy. Ten girls pressed charges. An MTM document, labeled "confidential," said a student had identified 30 victims. Journalists Finlay Young and Kathleen Flynn spent nearly a year digging into the story to produce a 13,000-word story and a documentary film. Young interviewed 80 individuals, including two girls who had testified against Johnson. "It allowed us the time really to delve deep and to treat the victims in this case in exactly the same way as we would treat them in a story in any country," says Young. We talked with Young about his work on the investigation. This interview has been edited for length. You were in Liberia during the time that More Than Me was getting established in Liberia. What was the impression you had of the organization and of Katie Meyler then? Meyler is someone who [is] committing everything she's got, and it's an altruistic endeavor. I think that's fair to say. It's possible to make a lot of money working in international aid, and that wasn't Katie Meyler. Even before any of this stuff came to light, there was a sense of vulnerability in More Than Me, because you had a lot of idealism, which is obviously a great thing. But you also had a lot of inexperience throughout the organization. You had a lot of people trying their best, but perhaps they weren't prepared for the complexity of what they were trying to do. I think it's fair to say based on our reporting that Meyler didn't necessarily understand the risks of what to her seemed like a simple endeavor of getting kids off the street and into school. 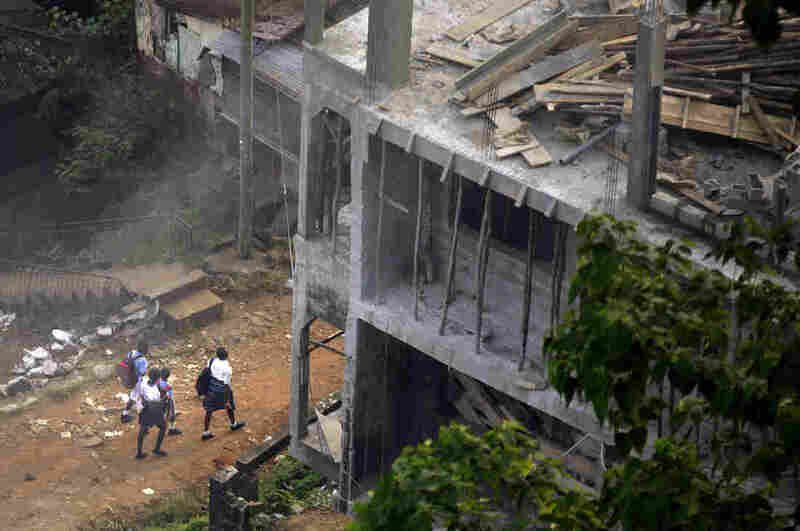 Liberia is complicated and bad things happened, and then bad things became worse things. A 2017 recap at @morethanmeorg ! Please share with your friends, family, the person next to you on the train! We need everyone on this rocket 🚀 to make our dream of reaching every girl in Liberia by 2021 possible! Let’s make 2018 our best year yet! Happy New Year!!! 🎆 we love you! The alleged abuse at the school first came out in 2014, just before Ebola hit. How did More Than Me leaders respond when they discovered you were investigating what had happened? There's a symbiotic relationship between charities and journalists. Charities can provide journalists with easy stories. But it very much changes that dynamic when the journalists look at the charity as a possible agent in bad stuff happening, and that's what happened in this story. The response to two journalists looking into what had taken place was astonishing. We weren't talking about a huge massive charity. We were talking about a small charity, but also a charity whose founder had a lot of experience with media and was able to leverage the media to tell stories to raise an awful lot of money. First of all, Meyler wouldn't go on the record, which is understandable in some ways. But once a PR company based in Manhattan was involved, it got much more serious. I don't know the decision-making behind the scenes, but vulnerable sources of ours, people we had interviewed in confidence in Liberia, ended up being questioned by the charity. Basically, what do you think of More Than Me? What did the journalist ask you? Would you like to take your information back if you could? And the PR company made accusations of unethical conduct, suggested that we hadn't been clear who we are, that we didn't have informed consent — the kind of stuff that, as a journalist, is the worst thing you can be accused of. That was hard in some ways to understand, because it meant that the story had to get longer. But in a way it made sense, because it was an organization that put itself in the center of the story throughout. And then in a negative story, they ended up putting themselves in the center of the story again, which was challenging for us, because we were so determined that the center of the story would be the experience of these incredibly brave young women [who came forward to tell their stories]. Schoolchildren walk near the coast in Monrovia in the early morning. You mentioned you wanted to investigate and tell the story in the same way journalists would in other countries. Was that process harder in Liberia, especially given the local support for More Than Me? A lot of our facts, in terms of timelines and who was where and everything else, came from social media. Many of the actors involved were very active in social media, so it was very modern in that way. But that was mixed up with an awful lot of pursuing strange leads in a taxi in the really hot weather, and waiting and chasing down these sources. There's an assumption very often that in a place like Liberia, there won't be any documents, there won't be rigorous transcripts, there won't be all these things you need to report. That's not always true. You can say "It's Liberia and it's harder," but the traditional elements of corroboration and following up are there. It's just a slightly separate context.